Generations of Ogdenites have grown up absorbing 25th Street’s legends of corruption, menace, and depravity. The rest of Utah has tended to judge Ogden—known in its first century as a “gambling hell” and tenderloin, and in recent years as a degraded skid row—by the street’s gaudy reputation. Present-day Ogden embraces the afterglow of 25th Street’s decadence and successfully promotes it to tourists. In the same preservationist spirit as Denver’s Larimer Square, today’s 25th Street is home to art galleries, fine dining, live theater, street festivals, mixed-use condominiums, and the Utah State Railroad Museum. 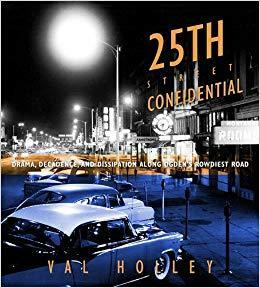 In his new book, “25th Street Confidential,” Val Holley traces Ogden’s transformation from quiet hamlet to chaotic transcontinental railroad junction as waves of non-Mormon fortune seekers swelled the city’s population. The street’s outsized role in Ogden annals illuminates larger themes in Utah and U.S. history. Most significantly, 25th Street was a crucible of Mormon-Gentile conflict, especially after the non-Mormon Liberal Party deprived its rival, the People’s Party, of long-standing control of Ogden’s municipal government in 1889. In the early twentieth-century the street was targeted in statewide Progressive Era reform efforts, and during Prohibition it would come to epitomize the futility of liquor abatement programs. This first full-length treatment of Ogden’s rowdiest road spotlights larger-than-life figures whose careers were entwined with the street: Mayor Harman Ward Peery, who unabashedly filled the city treasury with fees and fines from vicious establishments; Belle London, the most successful madam in Utah history; and Rosetta Ducinnie Davie, the heiress to London’s legacy who became a celebrity on the street, in the courts, and in the press. Val Holley on Access Utah. We’re compiling another UPR Community Booklist and we want to know what you’re reading. What’s on your nightstand or device right now? What is the best book you’ve read so far this year? Which books are you suggesting to friends and family? We’d love to hear about any book you’re reading, including in the young adult & children’s categories. One suggestion or many are welcome.